Oh no! An experiment in our Laboratory went wrong and now a bunch of Flip Caps are radioactive. 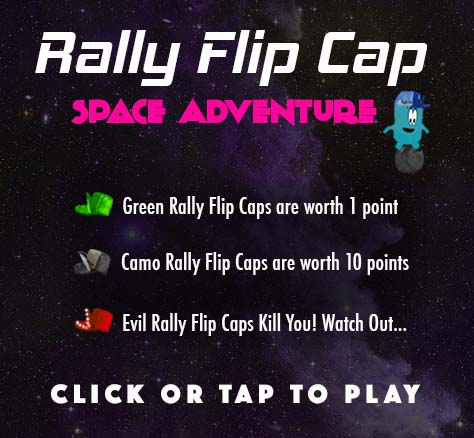 Please help Lil Rally collect all the Green and Camo radioactive flip caps! Watch out for the evil red ones, they will kill you. May the odds be ever in your favor. 2. Comment if you've been Naughty or Nice and tag 3 friends on our Instagram @RallyFlipCap post from Wednesday Dec. 13th. 3. The 5 people with the highest score will win a free Rally Flip Cap of their choice. The 5 individual winners have to live in the USA. Click the picture below to start playing. To Jump, use your mouse to click, finger to tap or the up arrow. Have fun and good luck. Go to Zenva Academy if you want to learn how to make games like this!